Architectural rendering of the Chrysalis amphitheater in Columbia, Maryland. (Click for a higher-resolution version.) Image © 2015 Marc Fornes; used with permission. tl;dr: In this series I explore the conception and construction of the Chrysalis amphitheater and Merriweather Park at Symphony Woods. highlights the various organizations on the “Chrysalis team” and the parts each of them have played or are playing in its creation. includes and provides context for more visual material relating to the Chrysalis, including detailed renderings, excerpts from engineering drawings, and photographs of construction and fabrication. Symphony Woods: The history of Symphony Woods and the various attempts over the years to develop it as a park. Vision and strategy: The initial vision for a new park in Symphony Woods and the strategy to implement that vision, as developed from the initial Inner Arbor concept plan to the current county-approved plan for Merriweather Park at Symphony Woods. Politics and process: The various institutional activities related to implementation of the Inner Arbor plan, with a focus on the Columbia Association, the Inner Arbor Trust, and the Howard County government, including its planning process. Design: The overall form of the Chrysalis and how that design came to be. Theater: The theatrical functions of the Chrysalis, including the stage, sound system, theatrical lighting, and “back of house” functions. 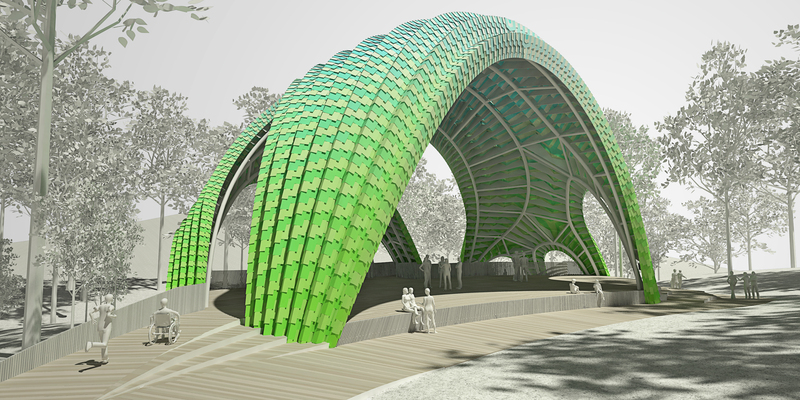 Shell structure: The steel framework supporting the Chrysalis skin and the theatrical equipment. Shell skin: The skin forming the external surface of the Chrysalis. Subfloor: The structural concrete foundation/basement or “subfloor” of the Chrysalis, and related construction. Details, details: The final details of the Chrysalis and its surroundings. Attracting the public: How the Chrysalis and other features of Merriweather Park at Symphony Woods will accomodate the general public and attract visitors. What comes next: Future features of Merriweather Park at Symphony Woods, including the Butterfly, the Merriground, the Picnic Table, the Caterpillar, and the Merriweather Horns. Timeline: A detailed timeline, with references, of the events and activities from the creation of Symphony Woods up to the public opening of the Chrysalis amphitheater. This series is based on material published by the Inner Arbor Trust and others, as well as on my previous blog posts about the Inner Arbor plan and its various features. Any opinions expressed are solely mine as an individual and do not necessarily represent the views of the Inner Arbor Trust, its contractors and partners, or any other person or organization. This work contains material from “Creating the Chrysalis” by Frank Hecker, originally published at civilityandtruth.com and released under the Creative Commons Attribution 4.0 International License.